Sea to Summit Trek Tk II Sleeping Bag redefines the industry standard for the classic tapered rectangular sleeping bag. The TkII is a great all rounder. Incorporating 2D PermaShell™ fabric and a premium 650 loft down, the Trek bags are a refined classic. The 60/40 fill ratio in the Trek bags is maintained using a side block baffle and differential cut shell. 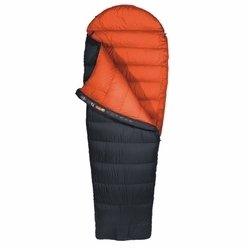 In the top of the shell a 3D side wall, a feature normally reserved for technical alpine sleeping bags, provides more space for the down to loft right to the edge of the bag. An oversized security pocket located inside the bag is easily accessible, ideal for stashing passports and other valuables while travelling. The soft touch lining fabric is down proof by construction and highly breathable offering a comfortable sleep. The Trek series is our choice for adventure travel and globe-trotting. Whether sleeping in hostels throughout Europe, backpacking South America or discovering the Stirling Ranges in Western Australia.